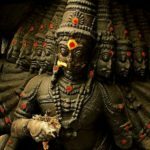 Who are the seven immortals of Hindu Mythology? People always ask, Who are the seven immortals (Chiranjivi) of Hindu Mythology? Well lets first start with the meaning of the wird Chiranjivi. Chiranjivi or चिरंजीवी in Hindi, are immortal living beings in Hinduism who are to remain alive on Earth through this Kali Yuga till its very end. Which means that Aswathama, King Mahabali, Veda Vyasa, Hanuman , Vibhishana , Krupacharya and Lord Parashuram are death-defying or imperishable personalities. Apart from these seven, Markandeya, a great rishi Who was blessed by Shiva, and Jambavan, a strong and wellknown character from Ramayana are also considered as Chiranjivins. According to The Mahabharata, Ashwatthama means “the horse-voiced”. It probably also means the one having strength of a horse. Perhaps the most interesting of all the Chiranjeevis, And one of the most intresting character from Mahabharata. 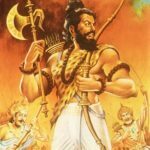 Ashwatthama was a great warrior and son of a legendary warrior and teacher named Dronacharya. He was gifted with a gem on his forehead by Lord Shiva and was said to have divine powers. When the battle of Kurukshetra A.K.A Mahabharata War was almost over, Ashwatthama who fought from the Kauravas, decided to murder the five Pandava brothers in their camp at midnight even though it was against the ethics of war to attack after sunset. Mistaking the identity of the five brothers, Ashwatthama killed the sons of Pandavas while they were away. On their return, the Pandavas saw what happened and were enraged with the incident and chased Ashwatthama to kill him. Ashwatthama seeked salvation for his crime but it was already too late. To defend himself, he decided to invoke Bramhashirastra [a sort of divine highly destructive weapon] against Pandavas. In retaliation, Arjuna invoked the same as he too was the student of Dronacharya and could do the same. However, on observing this scene, Lord Krishna asked them to revoke the weapons as it would have led to a cataclysmic event resulting in annihilation of earth. Arjuna revoked his weapon, however Ashwatthama was unable to do so as he was never taught how to. And thus Ashwatthama is destined to live a life of misery and pain till the end of this Kaliyuga. Mahabali or Bali was the “daitya” king and his capital was the present day state of Kerala. was the son of Devamba and Virochana. He grew up under the tutelage of his grandfather, Prahlada, who instilled in him a strong sense of righteousness and devotion. He was an extremely devoted follower of Lord Vishnu and was known as a righteous, wise, generous and judicious King. Bali would eventually succeed his grandfather as the king of the Asuras, and his reign over the realm was characterized by peace and prosperity. He would later expand his realm by bringing the entire world under his benevolent rule and was even able to conquer the underworld and Heaven, which he wrested from Indra and the Devas. The Devas, after their defeat at the hands of Bali, approached their patron Vishnu and entreated him to restore their lordship over Heaven. In Heaven, Bali, on the advice of his guru and advisor, Sukracharya, had begun the Ashwamedha Yaga so as to maintain his rule over the three worlds. During an Ashwamedha yagna, Bali once was granting wishes to his masses out of his generosity. Meanwhile, Lord Vishnu reached there taking form of a little Brahmin boy better known as his fifth avatar or Incarnation Vamana. The little Brahmin boy on reception asked from King Bali enough land to cover three paces of his feet. On acceptance of his wish, Vamana grew to an abysmal size and in two paces, took away all the living world and also the three worlds in general. [heaven, earth and underworld figuratively]. 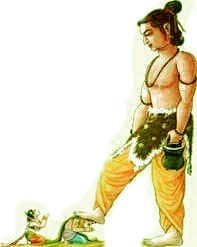 Having left nothing else to offer, for his third and final step, King Bali bowed down infront of the Vamana realizing that he was none other than his Lord Vishnu and asked him to place the third feet as this was the only thing that belonged to him. 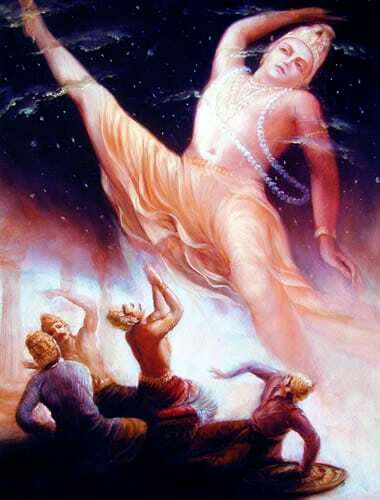 Vaman then took the third step and thus raised him to Suthala, the supreme form of heaven. However, looking at his generosity and devotion, Vamana on request of Bali, gave him permission to visit earth once an year to ensure that his masses are well off and happy. 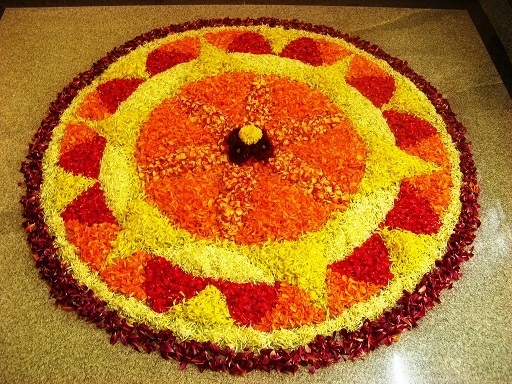 It is for this reason, that the festival of Onam is celebrated widely in Southern parts of India to welcome the arrival Onapottam, the symbolic form of King Bali. He is hailed to be a supreme example of the highest and the ultimate Sadhana of Nava Vidha Bhakti, namely Atmanivedanam. It is believed that Bali was a practitioner of the Raja Yoga.